Risotto is my long time favorite. We started cooking it with my parents somewhere in early 2000s. It was one of the first steps that got our family cooking to internationalize together with, say, the quiche. We couldn’t afford to travel much then, but we loved reading food magazines. These would kick off our imaginations at the start of every weekend and keep us busy in the kitchen till its end. Thus we picked up the risotto, studying the technology from a magazine article. 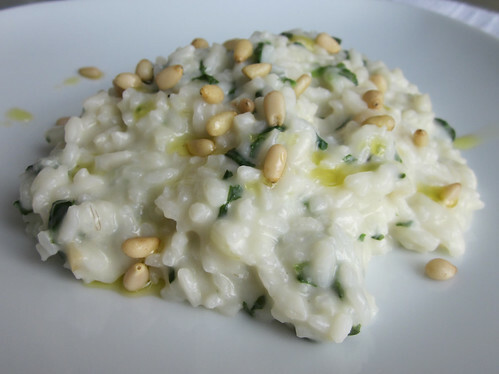 Even now, after cooking it one thousand times I think the beauty of risotto making process is just irresistible. If I had to pick a dish providing the best stress relieving cooking experience, risotto would probably lead the list. Watching Nigella's squink risotto recently I found she loves it and for the same reason. For now my favorite explanation of how to make risotto is written in Jamie's Italy (it is also up on Jamie’s website). It’s a great start if you’re making the dish for the first time. I must say, I like risotto with almost whatever dressing (giving preference to non-meat versions). Porcini, tomato, seafood were always among my parents and my own favorites. I was also always intrigued by the idea of green risotto (with pesto and different greens in it) given my love to pesto and spinach, but never got to actually try it so far. This time I again didn’t have any pesto, but I did have a lovely piece of gorgonzola (my other all time favorite) so I gave it a try. The combination with spinach and pine nuts played out very well. A glass of chilled dry white wine is a perfect compliment. So, sharing the recipe. Heat the stock (or water) and keep in hot. I find it most convenient to set a pan with the stock over very low heat right next to the pay, where I cook the risotto. So it is easy to ladle the stock in gradually later. Heat 1 tbs butter and 2 tbs olive oil in a medium heavy base pan. Set the pan over low heat. Add the shallot, garlic and celery and cook stirring occasionally for 15 minutes. The vegetables should soften, but shouldn't brown. Increase the heat to medium. Add the rice and cook stirring for 1-2 minutes till it gets slightly transluscent. Pour in the wine and cook till most of the liquid evaporates. Add the first laddle of stock. Cook stirring constantly till it evaporates. Then add the next laddle and cook stirring till it evaporates again. Repeat till the rice gets cooked and the overall texture gets creamy. This will take some 15 minutes. Cooling down risotto with thicken quickly. So at this stage you might make it a bit looser then you want it when served. When the rice is cooked, turn off the heat. Stir in the spinach, gorgonsola, parmesan and 1 tbs butter. Season with salt and pepper. Serve immediately, sprinkled with pine nuts and drops of olive oil. And don't forget about the glass of chilled dry white wine.